It looks like the party will keep on rolling on the Metro-North Railroad&apos;s Connecticut trains, as officials are moving forward with plans to replace out-of-date bar cars with new ones. With the new cars, there&apos;ll be none of that. And that&apos;s a problem. Bar-car regulars...are worried, though, about the proposed design. It includes three rows of seats, four banquette-style tables and three round tables in the middle of the car. That will leave far less standing space than on the current set of cars. 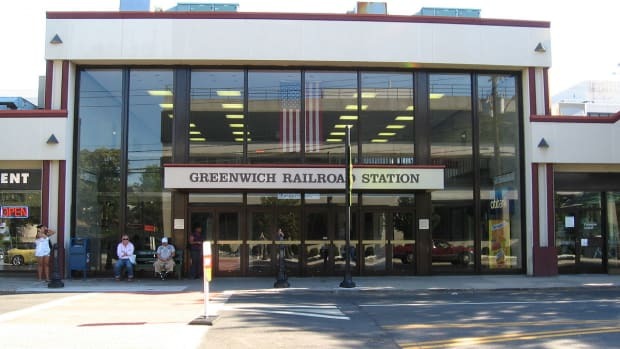 "We want to stand around and talk, and not be sitting in tiny little groups of four," said Terri Cronin, the vice chair of the Connecticut Rail Commuter Council, which has been surveying passengers about the new designs. "It&apos;s like a big group party," Ms. Cronin said. "You end up talking to all these people you never would have talked to if you were sitting in all these little social pods everywhere." Ms. Cronin and other passengers say they don&apos;t want to get stuck in small groups at tables. They&apos;d rather mingle. Ms. Cronin said that&apos;s how she&apos;s met business contacts and made good friends in the bar car. CT, this is serious. Don&apos;t take Ms. Cronin&apos;s "business contacts" away from her. Fight this one hard.